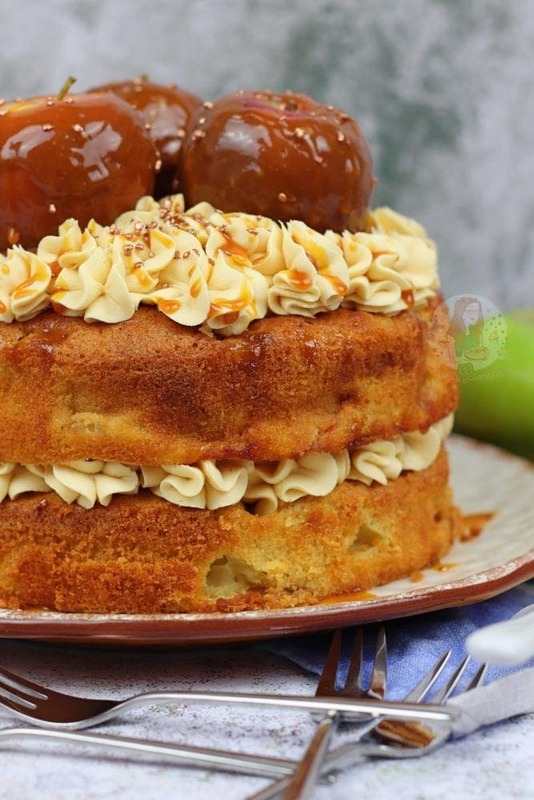 A Two-Layer Toffee Apple Cake with Apple Cinnamon Sponges, Toffee Buttercream Frosting, and Mini Toffee Apples to decorate! As its truly in the thick of Autumn now, I thought I would post something that literally tastes like Autumn in your mouth. I will admit that that it doesn’t actually taste like autumn… who knows what that actually tastes like, but… Toffee Apples are definitely autumnal. 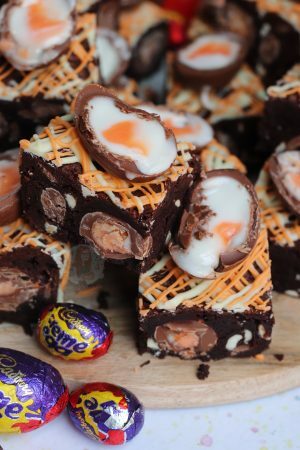 Halloween or Bonfire night, they’re a big hit. 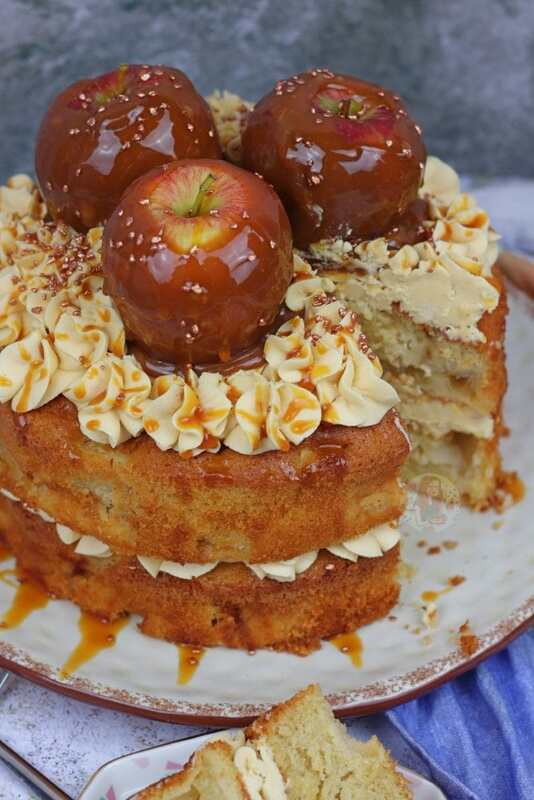 I decided to make this a bit of a messy Toffee Apple Cake because I wouldn’t really say Toffee Apples are a neat thing. The may look neat sometimes, but they’re sticky and delicious, so I think they work wonderfully on this cake. 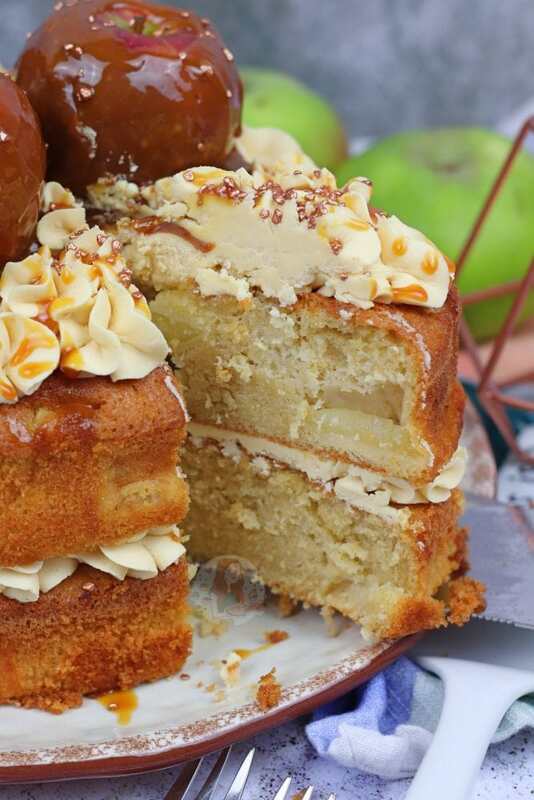 The cake is basically the exact same as my Apple Crumble Cake, but without the crumble part. In a nutshell, I didn’t want to mess with a really successful and yummy sponge. 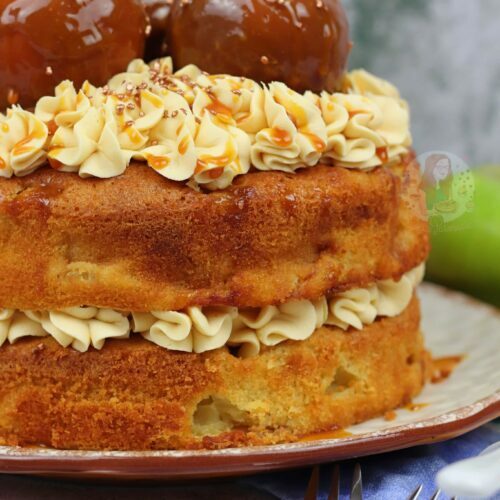 My Apple Crumble Cake has been popular since I posted it, and often people just bake the sponge part because it bakes perfectly with the cooking apples inside with the smidge of cinnamon as well. After posting my Butterscotch Cheesecake not so long ago, and explaining the difference between Butterscotch and Toffee in detail, I decided to kinda skip over all of that and roll with ‘Toffee Apple’ rather than ‘Butterscotch Apple’ because every knows of a Toffee Apple. To be fair, when googling Toffee Apples, they are often called Candy Apples… oops. 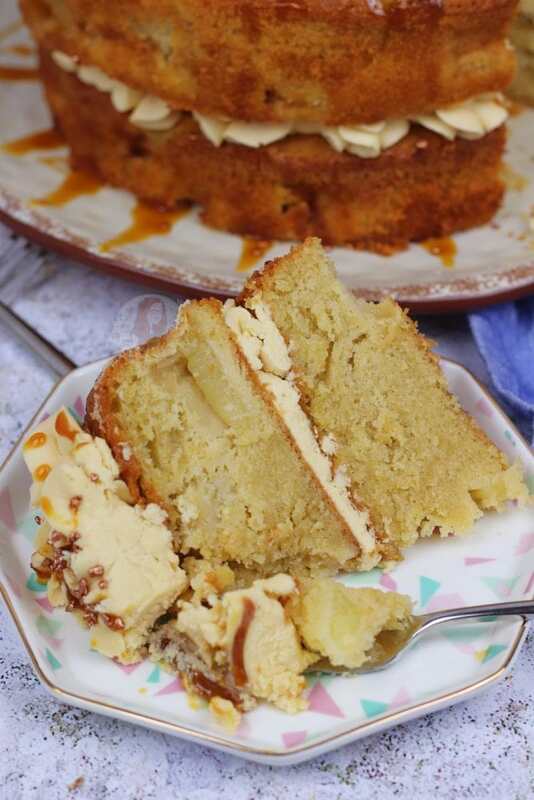 Because the sponge is wonderfully Apple flavoured, I thought the only way to make the Cake more Toffee like without ruining the sponge, was to make the frosting Toffee flavoured. The first time I made this I used up the rest of my Butterscotch sauce, and the second time I used Toffee Sauce from the supermarket. Both worked in the same way, and both were yummy. The Toffee Apples on top are a bit much I will admit… but I think it makes the cake look SO yummy. It makes it look sticky, sweet and delicious, but they are completely optional. 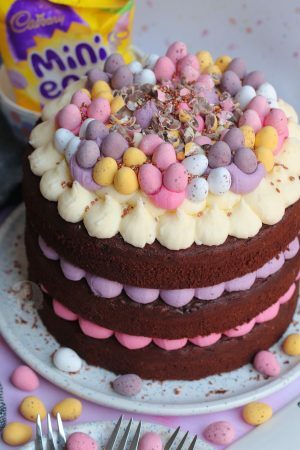 I did it because I wanted to emphasise the flavour of the cake with the decoration (how I often do), and I think it worked well! You can cheat and melt down Dairy Toffee sweets and coat your apples that way, or do it properly. 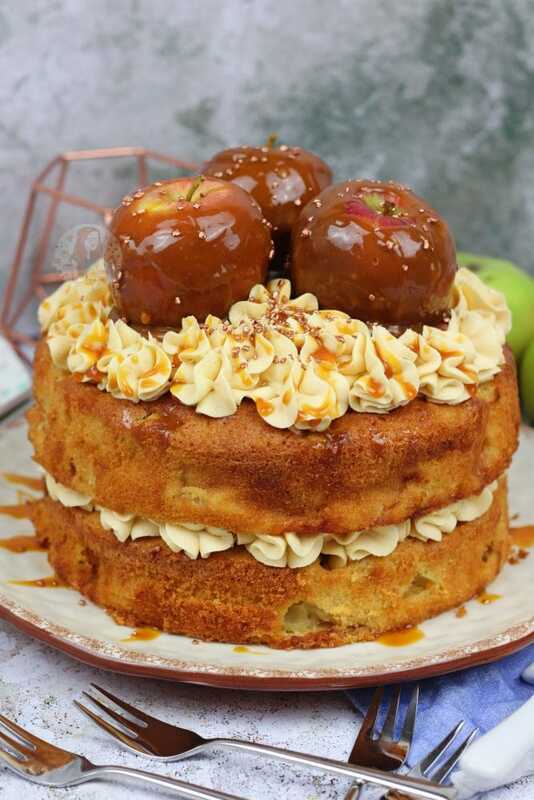 You can easily elevate this recipe into something a bit more spooky for Halloween by making the Toffee Apples red (with red food colouring) or string across some melted marshmallow to get a spiderweb effect. I personally think this looks utterly scrumptious as it is, but I get that some people will want to make this more Halloween themed! Preheat your oven to 180C/160C Fan, and line two 8" tins with parchment paper. Peel and core the apples, and chop into 2cm size pieces. Cover the apples with the 50g extra Light Brown Sugar and leave to the side for now. Beat together the Unsalted Butter and Light Brown Sugar until light and fluffy. Add in the Self Raising Flour, Eggs and Cinnamon and beat till smooth - it won't take long at all. Fold through the apple, and separate between the two tins. Bake the cakes in oven for 40-45 minutes, or until baked through. A skewer should come out clean, and the cake shouldn't be making a bubbling sound. Leave the cakes to cool in the tins for 10 minutes or so, then move to a wire rack to cool fully. Beat the butter on its own for a couple of minutes to make sure its nice and smooth. Add in the Icing Sugar 1/2 at a time, beating fully before adding in the rest. Add in the Toffee Sauce and beat again till its smooth and a lovely frosting has been formed! Get your first cake, and pipe on half of the buttercream frosting. Add on the second cake, and pipe on more frosting. 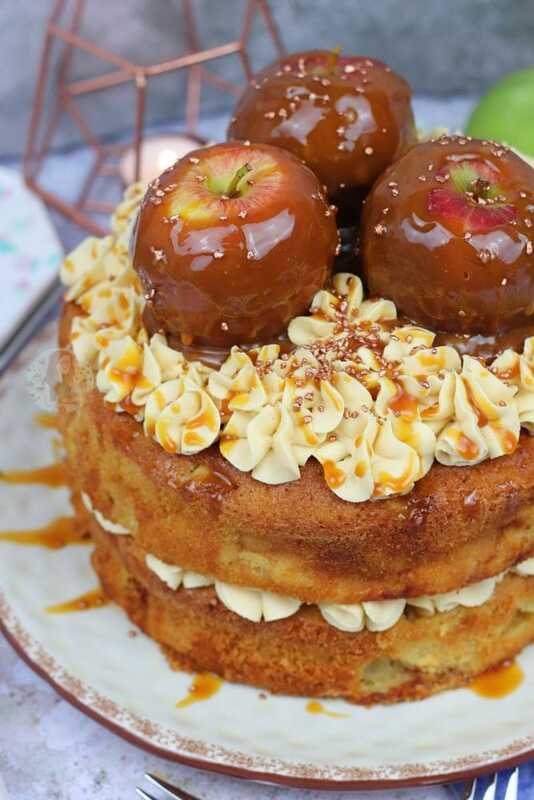 Top the cakes with your mini Toffee Apples if you're using them, and sprinkle over some cute sprinkles! 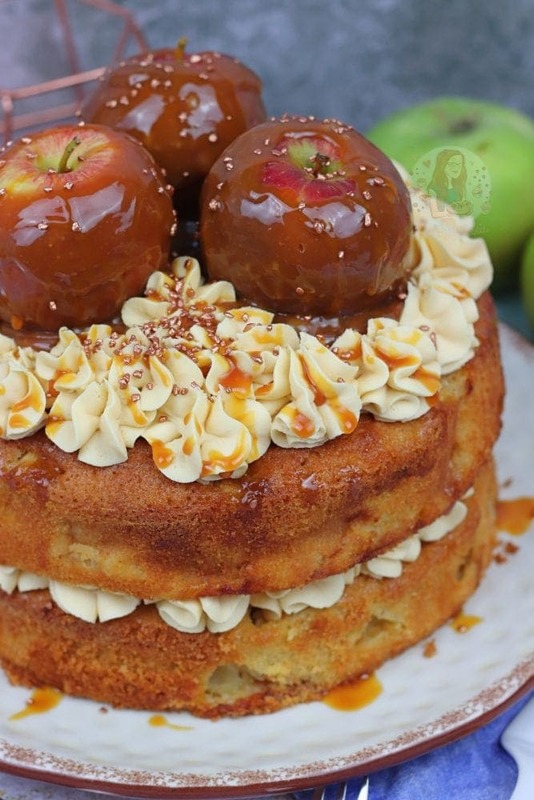 The Mini Toffee Apples on top are optional, they just fit with the theme. I used bramley apples (baking/cooking apples) as they're the best to use - regular eating apples will be too soft. 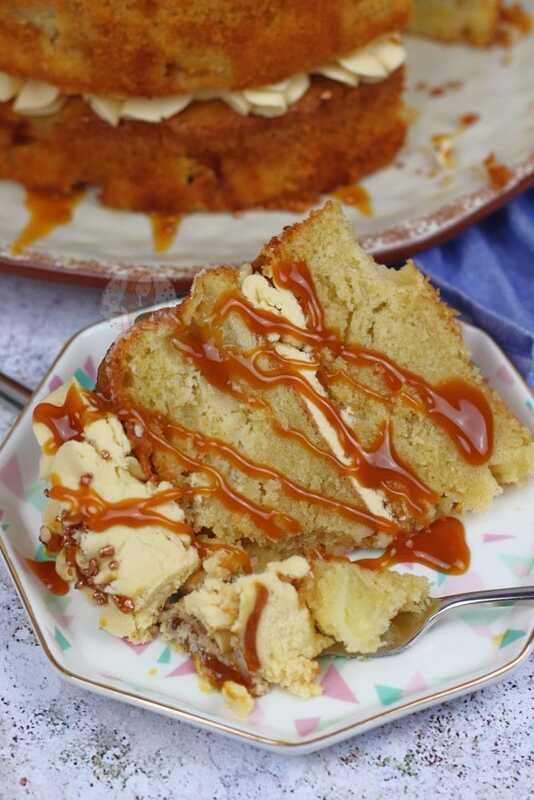 You can use my Butterscotch Sauce for the frosting, or buy toffee sauce from the supermarket. This cake will last for 3 days in a cake box at room temperature. Buy enough apples for about 700g worth, so once you have removed the core and peel you'll have about 500g worth of apple. 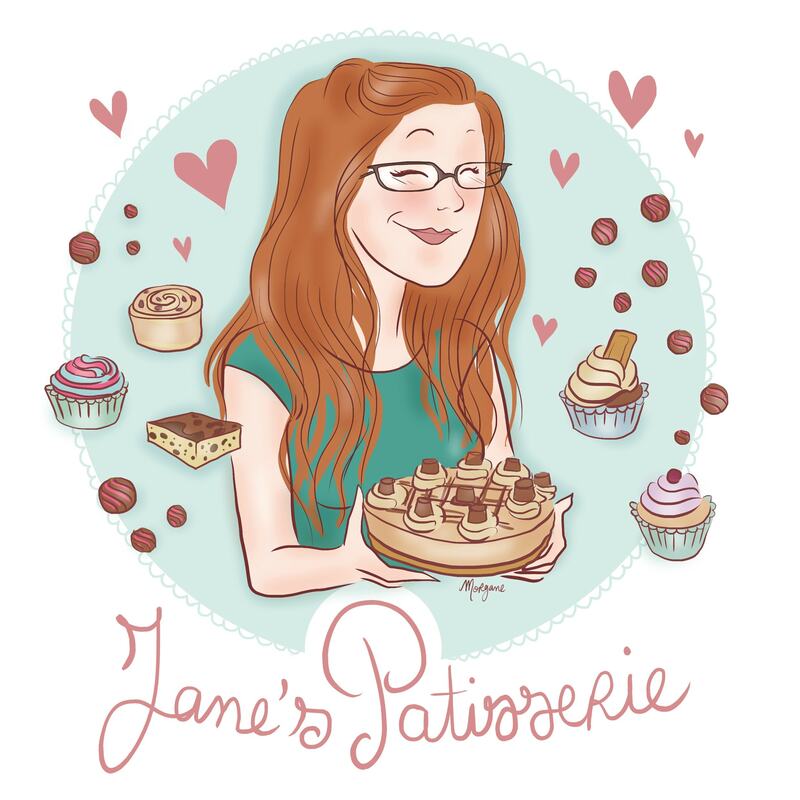 Older Next post: Toffee Apples! 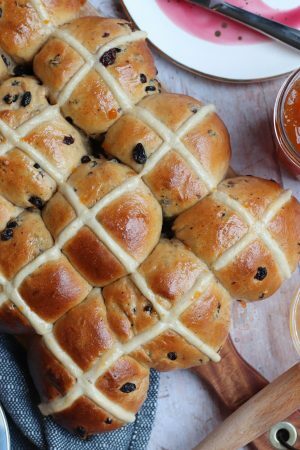 Could you bake this in one tin instead of two and then half it? how much longer would it need to bake? I’m afraid I don’t know, as I’ve never done it in one tin. This looks amazing!!! Do you think the recipe would work to bake as cupcakes? Hiya! THank you! 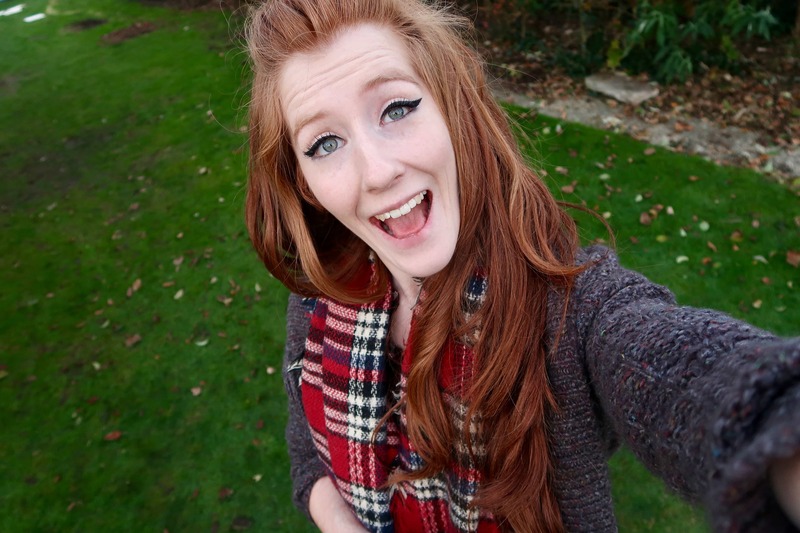 Unfortunately, there probably won’t be a vlog as I don’t have any time!